I measured a selection of these pants and found the waist size of the pants to measure out consistently at 2” larger than the stated size. Most men’s jeans will be sized this way these days…. it’s called vanity sizing, so most people can just choose the size they wear in jeans. Need help measuring? Get it here..
Klim’s Dakar pants for 2018 are now a great closeout deal! The closeout deal is for the Green or Orange colors shown here. 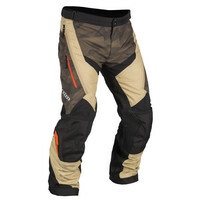 Dakar pants are a classic off-road design, but they cross over the adventure or street as well. For street, you can add armor to the hips and knees.